Born in Winnipeg, this left winger played junior with the 1953 St. Boniface Canadiens who were the Memorial Cup finalists. In 1954 he won the MJHL scoring title. He was on three Stanley Cup winners, two with Montreal Canadiens and one with Chicago Blackhawks in 1961 when he scored the Cup winner. 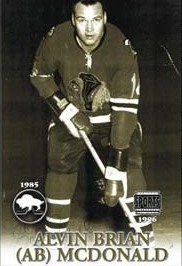 Ab McDonald finished his career with the WHA Winnipeg Jets and was their first captain in 1972.